The Regional Technology Center is located in the Titusville YMCA, and is offered to the entire community not just YMCA members. The Regional Technology Center offers individuals, businesses and organizations the necessary skills to keep pace in today’s environment. We offer a wide range of courses and workshops to meet all of you technology, career, personal, and business needs, staffed by a team of professionals helping you attain your objectives and goals. As a proud part of the Titusville YMCA, we offer you the same fairness, quality and respect you’ve come to experience from other YMCA programs. Being part of the community since 1912, we continuously strive to establish new relationships with individuals and businesses as well as strengthen existing ones. All courses, custom or scheduled, are approached with detail and geared towards specific areas of interest for our participants. We want to teach what you need to learn to reach your objectives. Walking into our computer lab might seem intimidating at first, but once here, you’ll soon forget you’re inside a teaching atmosphere and feel right at home. you’ll relate to our inspirational murals hanging on the wall, enjoy our complimentary refreshments, and feel at home. Your questions are highly encouraged before, during and after classes. Intro courses are the first level of learning about computers. You will learn the very basics of computers in these classes, designed for users with little or no experience. If you own a computer but rarely use it, or are thinking of obtaining one in the near future, this is where to start. If you use a PC on a somewhat regular basis, and looking to expand on you already existing knowledge of specific areas, these classes are for you. These courses are designed for users with some level of experience, but not at an advanced level. If you have completed all introductory courses listed above then you should be ready to take any beginners courses listed below. Digital Cameras - Learn techniques and terms to help you take better pictures with your digital camera. Students are encouraged to bring their own cameras with questions. Home Movies Made Easy - Learn the beginning steps to creating your own family masterpiece. Using software that comes with Windows XP you can author your own movie creations. 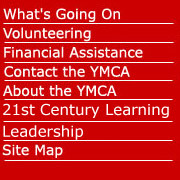 For Photoshop, web design, or other classes please call the YMCA at 827-3931 and leave your name, phone number, and what topic you are interested in, or ask to speak with Matthew Waychoff for further information. Classes will be created for those interested in times outside the offerings on this page.